You and your partner’s fingerprints make the heart in Amy Evenson’s sentimental artwork. Is it a coincidence that two fingerprints make a perfect heart shape? We think not. Celebrate your unique love with this personalized artwork by Amy Evenson. 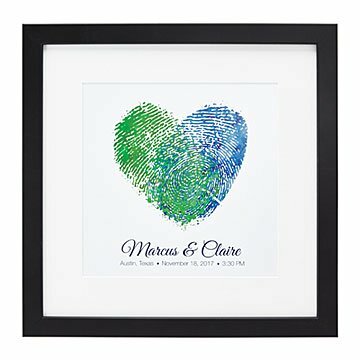 Each is customized with your names, a special date, place, time, and your fingerprints. To collect them, Amy mails you an ultramodern, clear plastic strip (no ink stains here!). Once she's digitally transferred the prints and turned them into a sweet colored heart, she safely disposes of your prints. Give the sentimental piece to a newly married couple or to your sweetheart as a one-of-a-kind anniversary gift. Made in Oregon.